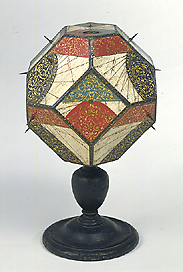 Eighteen-faced polyhedron mounted on a turned single stem baluster pillar stand and thus offering six inclining and declining dial surfaces, six reclining and declining, four vertical surfaces, and one horizontal face. The dials are drawn for Italian hours with pin gnomons, the single horizontal dial having an inset compass. The instrument employs the controlled flowing foliate decoration in gold on a red, blue or black ground characteristic of Buonsignori's dials, although in this case all the dials are drawn in black on a white ground. The dial is signed at the end of the 'Tropicus Cancri' band in the left hand of the pair of dials symmetrical around the south end of the horizontal surface. It is further signed by a single 'S' marked on the red painted lower horizontal surface to which the stand is attached. All hours are undivided although season and equator lines are frequently marked. The decoration is symmetrical around the north and south faces.